Changing the default storage location or folder for scanned documents it is possible from WinScan2PDF Version 3.77! From the version you can change if you want. (Image-1) Change the default location for scanned PDF documents! I recently redirected the Documents folder from some profiles to a new mirrored disk. I went to Windows Scan 2 PDF and it gave me an error message that it can not access scanned document folders. As far as I could see, it was redirected to the parent folder. It turns out that Windows 10 does not pass permissions to all subfolders. In example: "E:\Users\MyDocuments\Scanned documents". Although I am in the admin group, only special permissions appear. So I've added myself to each parent folder as a user and Windows Scan 2 PDF now opens and I can save the documents as default to the redirected location. Thank you! Enable auto delete temporary scans at program end! (Image-2) Auto clean up scanned JPEGs at Program end! 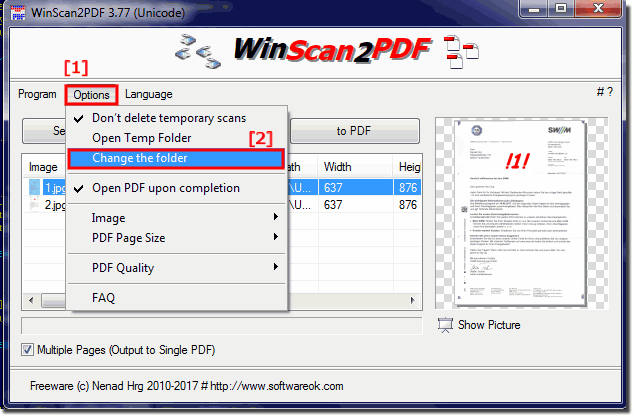 WinScan2PDF - FAQ-11: Change the default location for scanned documents! How can I change the location for the PDF files, is something in this program at all possible I would like it under Windows 10, in a certain Windows folder, the PDF files, because I like to archive all files by file types währe it really a great Thing if you can define the PDF folder yourself, and not every where else is stored, I think that other users happy. Is that something realizable?